Girls' Dresses, Flower girl Dresses, Girls Holiday Dresses, Little Girls Dresses Blog: Who should Pay for the Flower Girl Dress? Who should Pay for the Flower Girl Dress? Spotlight On Wedding Etiquette—Who Should Pay for the Flower Girl Dress? With the impending arrival of summer, we are fast approaching the busiest season for weddings. With that, wedding etiquette often emerges as a hot-button topic for debate, especially if you are in the process of planning your own wedding. Who should you invite to be in your wedding party? Who pays for what? All of these questions may seem simple, but anytime you approach an event with so many emotions and so much money involved, you definitely have the potential for hurt feelings if you’re not careful. Let’s be honest—your wedding is your big day, but it’s certainly not a free pass to disregard the needs and feelings of others. When selecting attire for your wedding party, including flower girl dresses, you need to keep your participants comfort and budget in mind. You may love that gorgeous, hand-beaded, chiffon explosion of a flower girl dress, but the mother of the child will probably balk at the budget-busting price tag. As adorable as you think your wedding selections are, always remember that your friends and family are doing you a favor, and many will spend upwards of hundreds of dollars on your event. Considering that they will probably only wear these garments once, selections that disregard their budgets are a recipe for resentment. With all this debate on wedding etiquette, where does the flower girl come in? Traditionally, all members of a wedding party are expected to pay for their own attire, and the same goes for the flower girl dress. However, if you can afford it, purchasing the dress yourself is a truly thoughtful gesture to both the child and her parents, especially since she will most likely outgrow the dress before getting any additional use out of it. By purchasing the dress yourself, you are extending kindness and consideration toward your flower girl’s. However, bear in mind that even if you purchase the dress yourself, you should still be cognizant of what the child’s parents feel is age-appropriate. If you decide to leave the dress purchasing to the parents, make sure you do your research and provide them with options that are affordable and that you know are available. If they have to scour the internet, only to find that a dress is discontinued, they will definitely not appreciate the wasted time and effort. Make it as easy as possible so that everyone can enjoy your wedding day, especially your precious flower girl! 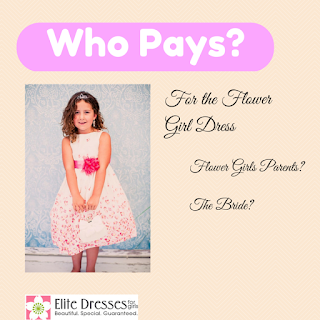 Looking for an affordable dress for your flower girl? Check out our Flower Girls Dresses to discover the most popular looks at bargain prices!